Tab Divider Size: Legal Size 14"Letter Size 11"
Description: Individual "Appendix" tabs. Side tab, 1st position of 1/5th cut. 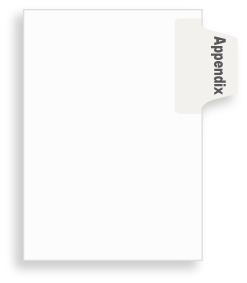 80# white paper stock with clear rip-proof reinforced tabs. Tabs are printed on both sides. Binding edge is unpunched so indexes can fit any binding system. Franklin Mills dividers are Made in the USA. Click here to view all our stock legal dividers. Need custom-made legal dividers? Custom printed indexes provide excellent reference to your legal files. Color mylar laminated tabs help organize your documents providing quicker access to important information. By organizing records, law firms save a tremendous amount of time filing and retrieving documents.